Timeo for Mobile is a time tracking application that enables to track, directly on your handhelp your working time, projects you work on and tasks you perform. 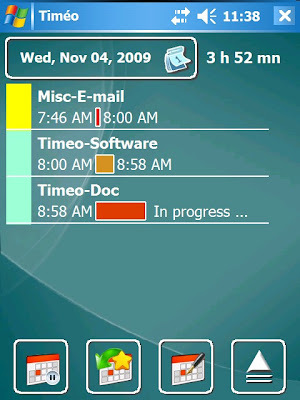 Timeo is simple to use, with an intuitive and finger friendly interface to easily and quickly store the start or the end of a task. Many features ( favorites, recent tasks list, pause button, resume button, ... ) allow to start or end a task in just one or two clicks. At anytime, you can create simple and accurate reports to know in details tasks you have performed on a specific period.